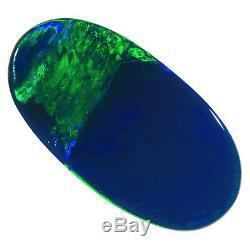 Amazing Green-blue Lightning Ridge solid black opal. Video will open in a new window. Estimated average retail value (gemval_com). 18.7 x 9.8 x 2.9 millimetres. Vivid mix of emerald green and rich sapphire blue colours right across the face, with more green at one end than at the other. Very flashy mix of broadflash and rolling flash patterns right across the front. Very dynamic pattern, very bright and sparkly. 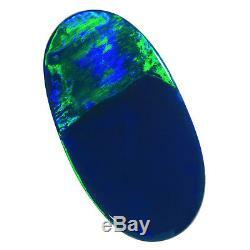 Large oval-shaped cabochon, with excellent proportions and a low dome. Perfect for a top shelf pendant or large ring. 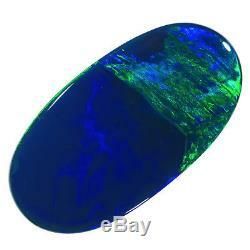 Flawless, brilliantly coloured precious opal across the front. No cracks, any lines are natural marbling or intersections between the colours. World famous Lightning Ridge, New South Wales, Australia. Guaranteed 100% natural earth mined solid opal. Not a doublet or triplet. The colour, pattern and fire in this stunning gem quality opal are shown fairly accurately in the photos and video, however in most conditions there are a lot more emerald green tones present. One for the opal connoisseur. This large and very impressive. 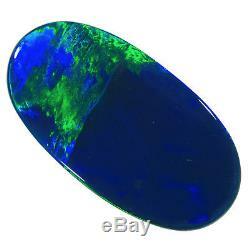 100% natural solid Lightning Ridge black opal has a gorgeous mix of vivid colours dominated by brilliant emerald greens and rich sapphire blues, and a flashy mix of broadflash and rolling flash patterns. Superb opal that is guaranteed to impress, it will make a very valuable jewellery piece, especially if set in white gold to contrast the rich colours. 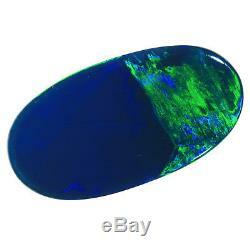 Recommended, a top gem quality opal with wonderful rich colours. All my opals come individually boxed in attractive display cases, and are sent. Please check out my other opals. Unlike most gemstones, valuing opals can be very subjective and is often influenced by the personal taste of the valuer. I use an online appraisal system (Gemval) to provide an estimate of the relative value of all my opals, and also provide my personal estimate of retail value based my 35+ years experience in the opal business. Photography is an enjoyable part of my opal hobby, and to make my photos as accurate as possible all my photos and videos are taken using a professional lighting system that replicates natural sunlight, and a digital SLR camera in standard mode. All photos and video are exactly how they came from the camera, with no enhanced settings or retouching in any way. Because every opal photographs differently, I also include in the description additional comments about the accuracy of the photos. Despite the care I take in accurately photographing and describing my opals, differences in computer monitors and lighting can sometimes occur. See my outstanding feedback with lots of repeat customers! Wholesalers and overseas buyers welcome! Opal Body Tone Scale as per recommendation by the Australian Opal and Gem Industry Association Ltd.
1 Faint, 2 Dull, 3 Bright, 4 Very Bright, 5 Brilliant - Gem Quality. My name is Ken and I love opals. I have been cutting opals off and on for the past 35 years, including running my own successful opal business in the 1970s, cutting, wholesaling and exporting thousands of opals to customers all over Australia and Asia. During this time, I've made lots of friends and mining contacts on every opal field in Australia. These days I've retired from the trade, but I still love the thrill of cutting and polishing opal, as unlike other gemstones you never really know how an opal will turn out until it is completely finished and polished. I only cut opals for the pleasure as a hobby, not for the profit. Having friends and long time contacts on all of the opal fields means I source quality opal rough easier and cheaper than others. I also still have a large quantity of rough opal that I have obtained over the years. My 35+ years experience means I can quickly cut and finish opals to the highest standard, using techniques I have developed and the latest cutting and polishing equipment. I enjoy hearing from people, answering any opal-related questions, and talking to all those other opal lovers out there! Cutting and collecting opals is a great hobby that has given me many years of pleasure, and hopefully will give me many more! THANKS FOR LOOKING AND HAVE GORGEOUS DAY! 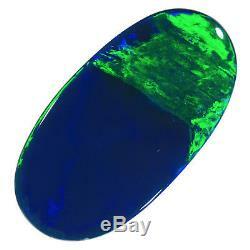 The item "MAGNIFICENT EMERALD GREEN-BLUE 18x9mm 3.49ct SOLID BLACK OPAL LIGHTNING RIDGE" is in sale since Saturday, October 13, 2018. This item is in the category "Jewellery & Watches\Loose Diamonds & Gemstones\Loose Gemstones\Opal\Other Opals". The seller is "kasle46" and is located in Bald Hills, QLD. This item can be shipped worldwide.